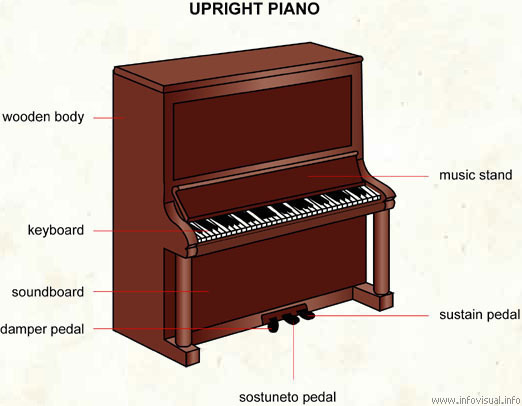 Upright piano - Visual Dictionary - Copyright © 2005-2016 - All rights reserved. [img]https://infovisual.info//storage/app/media/04/img_en/024 Upright piano.jpg[/img] [url=https://infovisual.info/en][/url] - [url=http://www.infovisual.info/]Visual Dictionary[/url] - Copyright © 2005-2016 - All rights reserved. Upright piano: piano with its soundboard placed vertically. Sustain pedal: allows to maintain the sound longer. Sostenuto pedal: allows to maintain the sound produced before pressing on this pedal. Damper pedal: allows to soften the sound. Soundboard: part of the body that amplifies the sounds. Keyboard: set of keys that are pressed and depressed to play piano.